In the earliest days of MTS, was there something that came before LINE files? No. 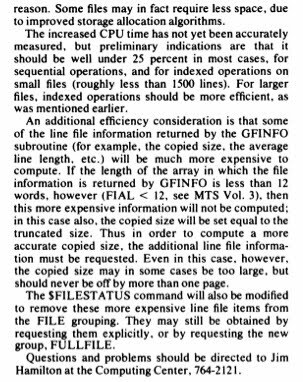 Line files were there from the very beginning, although with more restrictions on the size of a file and the length of a line as you've already pointed out. Line files existed even before paging. You guys remember a lot more about disk formatting than I do. I must not have been terribly involved in the conversion to page sized blocks/ buffers ( I remember tracks and records :). Possibly Jim Hamilton or George Hellfrich had taken over the file system by that time? I am trying to remember what we did initially for the data cell?. I know we were concerned about efficiency and I have some recollection that we did some special things to make sure that once we went out to read/write some data from the data cell, we made sure we did everything we could, efficiency wise, wrt tracks and records, once we got the strip out and wrapped around the drum. Mike do you remember any of that? I remember us talking about it back then, but not the details of what we actually did. It most certainly had to do with sequential files, so I suspect that we just read/wrote (sequentially) as much data as we could, on the same strip, at any point in time. Sequential files were invented for the data cell. That was the only reason we invented a separate file type. We figured that be eliminating random access (or at lest making it harder) we could avoid picking strips so often. Sequential files read and wrote pages sequentially which hopefully would keep the same strip active for longer. I’m not sure if there was anything special about sequential files on the data cell as opposed to on disks. Did SEQWL files come at the same time as SEQ files? Yes. They were meant mainly to be a way to save line files on the data cell. We didn't allow you to create a line file there so if you wanted to save a line file on the cheaper data cell storage and preserve line numbers you needed to use a SEQWL file.